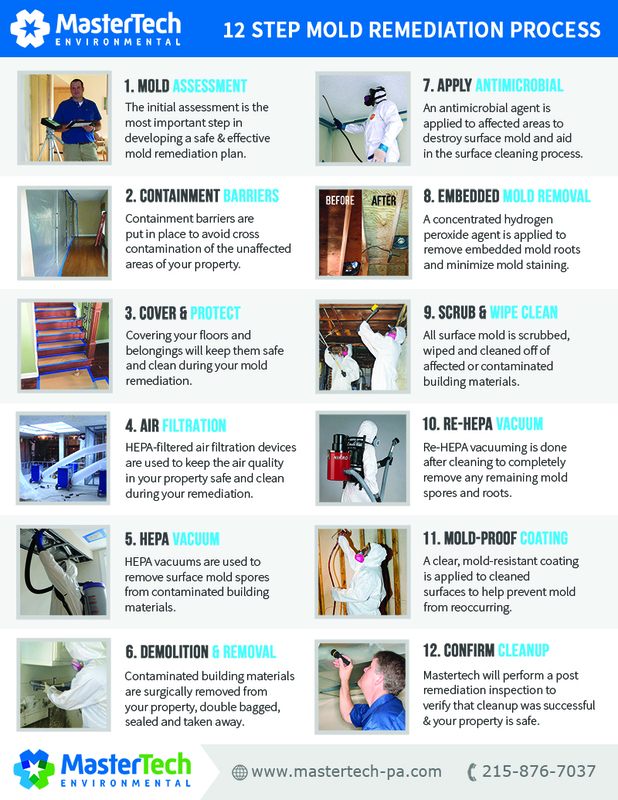 Attic Mold Remediation PA – Professional, Guaranteed. Your Pennsylvania attic can be the perfect environment for serious mold development. Conditions like excessive heat, high humidity, or roof leaks can be an adequate water source for excessive mold growth. Poor ventilation and/or poor insulation in your Eastern PA attic can lead to reduced air circulation and can encourage moisture buildup. If you detect signs of a potential mold problem in your PA attic, contact a certified mold remediation professional who will be able to safely and effectively assist you. Mastertech of Eastern PA’s attic mold remediation professionals can identify if your attic has a mold problem and develop a safe and effective attic mold remediation plan. Once your attic is clean and safe, we will make recommendations for preventing mold recurrence. What causes attic mold in Pennsylvania? Aside from the obvious roof leak, some moisture problems are not as easy to spot. Moisture buildup in the attic can easily go unnoticed. As hot air rises in your eastern PA home, it collects in your attic. Attics can be very vulnerable to excessive moisture build up if not properly ventilated. Warm air in the attic can lead to condensation and elevated humidity. Yes. The effects of mold exposure varies per individual. Mold symptoms range from mild allergic reactions to severe upper respiratory problems. Some individuals may be more sensitive to the effects of mold, while others may not be bothered at all. It all depends on the individual, the species of mold, the length of exposure, and several other factors. In addition to potential health problems, living in a home with mold is simply unsafe due to the underlying water problems. Where there is mold, there is a water source. Mold and water damage can eat away at your building materials and seriously compromise the structural integrity of your home. That is why attic mold remediation will ALWAYS include moisture control tactics to prevent future problems. A thorough attic mold inspection in Eastern PA, completed by a professional, will determine if you have mold, how bad it is, what caused it, and how to properly fix the problem. Visual Assessment– Your Mastertech inspector will complete a comprehensive visual analysis of your Eastern PA attic to identify any conditions that could be causing and sustaining mold growth. Every mold inspection will be digitally documented. Moisture Mapping– Your inspector will carefully map out the damp or wet areas of your attic to determine moisture migration patterns and get to the bottom of where the water starts and stops. Moisture Meters: Moisture meters allow your inspector to read the moisture content of building materials in your attic. Moisture locked within porous building materials like foundation walls can go unnoticed for a long time. Attic Mold Testing– Surface and/or air quality tests will provide scientific data that will confirm or deny the presence of mold. If mold is confirmed in your attic, the test results will help your inspector figure out the most appropriate course of action to resolve the mold issue. Report of Findings– Your Mastertech inspector will develop a detailed, easy-to-read report that outlines what the inspector did, what he/she found, and what to do next. If deemed necessary, your inspector will present you with a detailed scope of work for a safe and effective attic mold remediation. The PA attic mold remediation professionals at MasterTech of Eastern Pennsylvania are thoroughly trained and equipped with the necessary knowledge, skills, and tools to safely address your attic mold remediation needs. Our mold inspector will develop the safest and most efficient scope of work that is tailored to your specific mold remediation needs. This will ensure that your attic mold is safely and properly addressed. Call 1 (215) 876-7037 today to ask about attic mold remediation services in Eastern PA. We will be happy to answer all your questions and schedule you for an appointment with one of our certified professional mold inspectors.